Phase Contrast and Cutting-Edge Design. This microscope combines CCIS (color corrected infinity objective system) optics with an innovative mechanical design to meet the needs of demanding users. Its small size conserves desk space and the ergonomic design makes this scope compatible with the way you work. The focusing knobs, controls for the mechanical stage and light intensity, are placed conveniently at your fingertips to minimize user fatigue, and the nosepiece, located under the stage, moves for focusing instead of the stage. The scope comes with 4X plan achromat lens and 10XPh and 20XPh phase contrast lenses with a 10–20X phase slider/brightfield attachment. Illumination is provided with a centerable lamp that is housed above the stage and has an externally operated mechanism allowing control over all facets of illumination. In addition, a segmented illumination intensity indicator is ideally located for easy viewing. The Seidentopf-style binocular head with diopter adjustment in one eyepiece provides viewing comfort. The trinocular version features built-in diopter adjustment in the third tube as well. 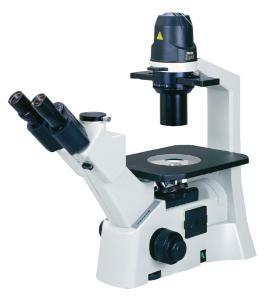 The microscope comes with blue, green, and ground glass filters for brightfield and phase applications; a slide holder; dust cover; immersion oil; lens paper; and an instruction manual. 110–120 VAC with a 6' 6" cord.